The Superficials is the culmination of years of collaboration between musicians Josh Millman and Michael Page. Having shared the stage for over a decade in a variety of bands in Portland,Oregon, the duo is resurrecting the dying art of the pop hook. Hard-hitting veteran drummer Rob Nelson helps round out the band's powerful stage and studio presence. Imagine The Kinks fighting The Vines with Elvis Costello as the referee. The Superficials' music combines elements of classic pop songs of yesteryear with a distinctly modern edge. Having released a few earlier recordings to great critical acclaim, The Superficials' 2004 release "Everybody's Girl" is quickly gathering even more accolades for the band. 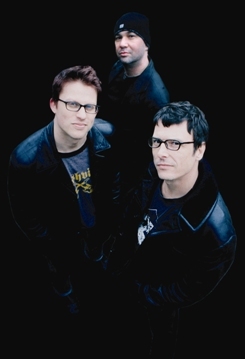 Websites like garageband.com and popbang.com have given rave reviews to the new album, featuring The Superficials as "artist of the week" and several songs as "track of the day" or "track of the week" in the pop/rock genre. In 2003, the band won Budweiser's "Battle of the Bands" to become the True Music Live band for the state of Oregon. A national radio spot was produced and played in heavy rotation featuring their song "Go Go Dancer." The Budweiser program was so successful that they've renewed the band's sponsorship for 2004. The band has also had several songs placed in independent film soundtracks, as well as backing tracks used in TV and radio advertising. With all of this gathering momentum, The Superficials are poised to achieve a new level of prominence and attention in the international pop/rock scence. * Your song 'LSD' has just been added to Universal radio 00.1 station! * Your song 'LSD' has just been added to Battle of the bands radio 00.2 station! * Your song 'LSD' has just been added to Nathan's Picks station! IMP Your song 'LSD' has just been added to Kayak Classics station!